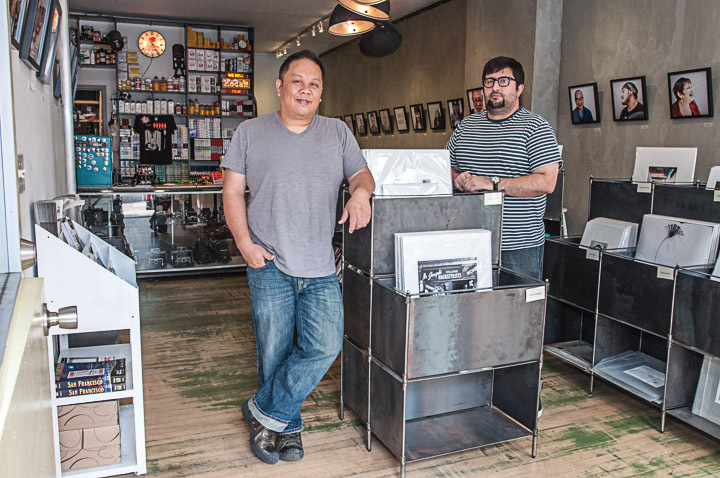 Once aspiring photographers and City College students, Matt Osborne, Gordon Szeto and Hung Tran now have a photo gallery and film supply store in San Francisco, that showcases the work of local Bay Area photographers. “We weren’t looking to get degrees, but [wanted] experience and [to] learn photography,” Szeto said sitting on a wood chair inside of 4×5 Gallery located at 442 Haight St. Since the three friends started the business in November 2012 their goal has been to help emerging local artists. “We try to help people to get noticed, sell their work and hopefully move on with their careers,” Szeto said. Over the last year, Szeto and Tran have exposed the creativity of several City College students. Osborne, responsible for the film supplies store inside the gallery, has the intention to start a photo-lab soon “to tie it all together,” he said. “This place is awesome,” former City College student Tracy Marin said. She came to the store to get some supplies after reading positive reviews online. “Location is perfect, and he seemed very nice,” customer Norman Ishimoto said, referring to Osborne. City College photography student Noelle Trinidad came to the store because of word-of-mouth. She also wants to support City College and locals and keep film alive. 4×5 Gallery is now exposing the work of Lisa Wiseman – The 30Love. Photos by former City College student Yelena Zhavoronkova will be on display Oct. 8-24. The store is open 12:00-6:00 p.m. daily.